We now offer ESKATA, the first and only FDA-approved topical treatment for raised seborrheic keratoses (SKs). 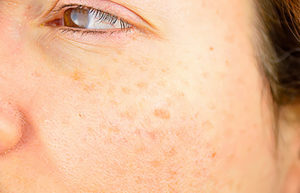 SK spots can be flat or raised with a color that is your normal skin tone or darker. Flat SKs have a velvety or shiny texture. Over time, they may get bigger and more may show up. They may also become thicker and raised with a waxy or rough texture. With its proprietary solution and soft-tip, pen-like applicator, dermatologists can target and treat raised SKs with ESKATA. SKs can appear anywhere on your body, but are most common on the face (hairline/temples), neck, chest, and back. SKs are harmless spots that pop up as we age. While they may appear concerning, you shouldn’t worry if you have them. SKs are non-cancerous and generally don’t cause any pain or discomfort. SKs are the most common type of bumps seen in a doctor’s office; if you have any concerns, consult a dermatologist to see if your spots are SKs or something more serious. To schedule an appointment call 757-622-6315 or request an appointment online.